Credits: NASA/JHUAPL/SWRI and Dr Paolo C. Fienga for the additional process. and color. A number of Chasms, plus countless - and still Unnamed - Impact Craters, and an extremely dark North Polar Region (a frozen Sea of Hydrocarbons maybe?!?) are revealed in this wonderful image of Pluto's largest moon, Charon, which was taken by the NASA - New Horizons Spacecraft on July 11, 2015. A huge (about 60 miles - such as approx. 96,5604 Km - across) Unnamed Impact Crater, with a VERY dark Floor, lays at about 6 o'clock of Charon's disk (near the South Polar Regions of the moon) and it can be easily seen here. The brightness of the Rays of (still unknown) Material blasted out of the Crater suggest that it formed in relatively recent times ("recent", of course, in Geologic Terms), probably after a collision with a small Kuiper Belt Object (or "KBO", for short) some time in the last Billion Years. On the other hand, the darkness of the Unnamed Crater's Floor is truly intriguing. One explanation is that the Crater has exposed different types of Materials that are (or contain) more Reflective (Water?) Ice than the Ices which lie on the rst of the Surface. But another possibility - even though less likely, in our humble opinion, as IPF - is that the Ice laying in this large Crater's Floor is made out of the same Material as its surroundings, but it has a larger Ice Grain Size, which therefore reflects less Sunlight. In this scenario, the Impactor that gouged the Crater melted the Ice that was already in the Crater's Floor, and then this Ice (the very same, original, one) refroze into larger grains. 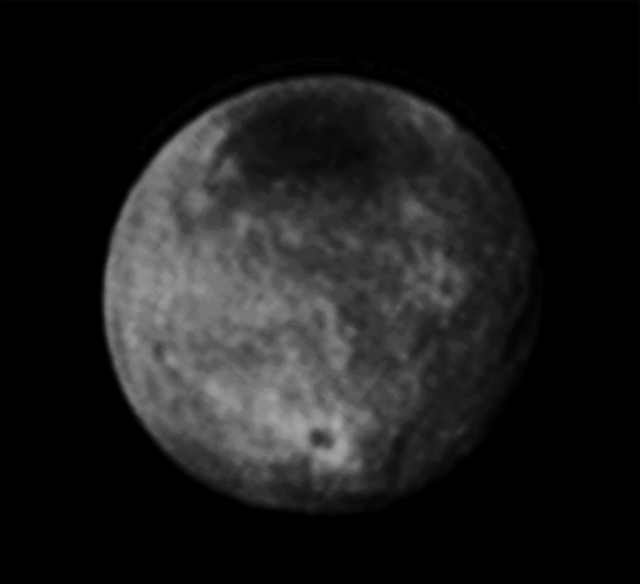 The image (which is an Original NASA - New Horizons Spacecraft's b/w and NON Map-Projected frame published on the NASA - New Horizons Mission Page with the ID n. 071215_Charon_Alone) has been additionally processed, magnified to aid the visibility of the details, contrast enhanced and sharpened, Gamma corrected and then colorized (according to an educated guess carried out by Dr Paolo C. Fienga-LXTT-IPF) in Absolute Natural Colors (such as the colors that a normal human eye would actually perceive if someone were onboard the NASA - New Horizons Spacecraft and then looked ahead, towards the Plutonian moon Charon), by using an original technique created - and, in time, dramatically improved - by the Lunar Explorer Italia Team.